Born out of cataclysm in 1948, the Kashmir problem remains alive and unwell. 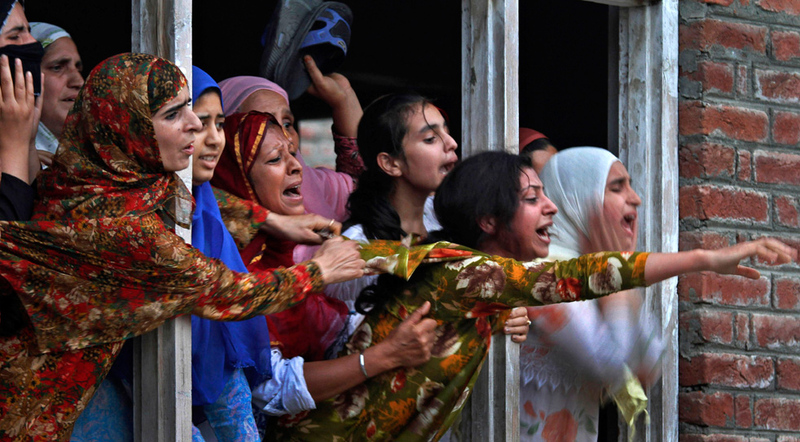 In the latest iteration of the long self-determination struggle, 75 protesters have been killed by Indian security forces firing pellet loaded shotguns to control the demonstrations; over 7000 have been injured including 117 who have fully or partially lost eyesight, a tragedy worsened by their young (around 18 – 22) age. What do we want? Freedom! That’s the slogan reverberating across the Kashmir valley. India and its security forces are (more than ever before) ‘the other’ as the youth rebel against India’s oppressive hold since the quarter-century old militancy began. It has quashed the usual dreams and aspirations of the young leaving them embittered and without many options. The proximate cause this time was the July 8th, 2016 killing of Burhan Muzaffar Wani in a joint operation by paramilitary forces and police. A handsome, charismatic leader, he relied on tech and social media to recruit for his Hizbul Mujahideen: Never fired a shot in his six years as a rebel as the police freely admit. More worrisome for the authorities, a moribund militancy has been revived and this time the leaders are local. Thousands took to the streets in protest after the news of Wani’s death became public. The sermons in the mosques spur on the faithful each Friday. Demonstrations continue as deaths and injuries mount, the funerals leading to processions and more deaths in an endless cycle. That Kashmir has reverted to active militancy is in part due also to the ruling BJP in Delhi attempting to change the special status of Kashmir as guaranteed by Article 370 in the Indian constitution. Instead of a celebration, Eid on September 12 brought a complete shutdown. For the first time in Kashmir’s history, the government imposed a curfew in all ten districts of the valley and prayers at shrines and mosques were not allowed on the holiday. In the meantime the violence continues. A three day encounter with the army and police in the Poonch district has resulted in the deaths of four militants as announced on September 13. The UN Commissioner on Human Rights, Zeid Ra’ad Al-Hussein, speaking at the UN said, “We had received reports and continue to do so that Indian authorities had used force excessively against the civilian population.” He demanded India allow an international commission to visit Kashmir. India refused. As early as 2008 the UN High Commission for Refugees issued a report stating Kashmir was only partly free. Not surprising when the leaders the people want to represent them are barred from elections. What of Hizbul Mujahideen? They have a new leader Sabzar Ahmad succeeding Burhan Wani — his photo like his predecessor’s has gone viral. What are national boundaries in a globalized world? India spends billions on security forces and is hated by the local populace. It would, instead, be reaping the profits of trade with an autonomous Kashmir, while burying the hatchet with Pakistan and gaining further from a country of nearly 200 million ripe for Indian exports. A final sobering thought for the existing territorial imperative: after almost 70 years of independence, a fifth of India’s 1.2 billion population live in extreme poverty. They number more than the rest of the world’s poor put together. The rulers callousness and obscurantist approach has caused severe damage to life and liberty of Kashmir. Meanwhile, the centre and state government is being haunted by national and international human rights activists. Even then, the centre and its lackeys in state government are not obeying the UN charter on human rights and continuously abusing the basic human rights. Gross human rights violations has been reported.only but govt should take stern steps. Human rights abuses have made India as a failed state in the eyes of foreign community…!